Ben is an experienced litigator in high stakes real estate suits and other complex legal cases. 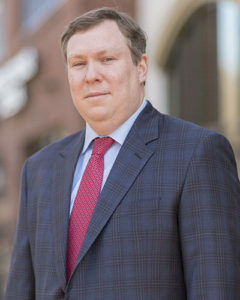 He has an extensive practice in complex commercial, construction and consumer litigation; collections; tort defense; commercial evictions; financial litigation; wrongful death claims; and alternative dispute resolution. His clients include real estate developers, construction companies, landlords, individual owners of real estate, and financial institutions. Ben enjoys both the thrill of courtroom litigation, as well as the opportunity to work to find creative and appropriate resolutions for his clients. He strives for the perfect balance between aggressive advocacy and risk management. This allows his clients to make informed decisions regarding resolution of their cases. Ben is also a certified mediator in the State of North Carolina. Obtained summary judgment quieting title for three separate properties involving more than 30 defendants. Obtained judgment against owner in excess of $800,000 for deficiency on vacation property in the Outer Banks. Obtained a jury verdict over for over 800% of the value offered by defendant prior to trial in a breach of contract action. Obtained dismissal of lis pendens and lawsuit for tortious interference with contract arising out of $2 million sale of land to developer. Obtained near million dollar settlement for clients who lost their mother in a collision with a commercial vehicle. University of North Carolina, J.D.